One of the biggest criticisms that I’ve received about my previous interview books is that the men I conversed with disproportionately outnumber the women. While I have always maintained that gender had nothing to do with how I chose my subjects, the male-to-female imbalances continued--as did the criticisms--so I have long wanted to do a collection that was composed exclusively of interviews with brilliant and remarkable women. That was part of the inspiration for doing this book. Another inspirational source came from my previous use of psychedelic sacraments--like LSD, cannabis, psilocybin (“magic”) mushrooms, DMT, and ayahuasca. Among the many mysterious effects that psychedelic substances have on the human mind, their powerful enhancement of sensory perception and the creative imagination is intrinsically intriguing. I have long loved visual art that attempts to capture the astonishing visions and extraordinary eidetic imagery that one sees while under the influence of hallucinogens. A third inspirational force arose from the partnership with my wife, Visionary artist Rebecca Ann Hill. Many of the questions that we asked the talented artists in this book came from epic, late-night discussions that Rebecca and I had about the complex nature of creativity, the mystery of artistic genius, the challenge in capturing the details of a psychedelic vision, and the discovery of unexplored artistic possibilities. Allyson’s beautiful paintings express colorful patterns of sacred geometry. These geometrical, sometimes symmetrical, mosaic-like arrangements of colored panels and mysterious alien language characters are uniquely gorgeous. They have unusual mind-altering properties that can induce powerful trance states. Rebecca: Your artwork is so vibrant in color; I’m most curious about how you achieve the unique effects that you do. Can you share some of your artistic secrets, like what specific types of paints and tools you use when you work? Allyson: Watercolors, acrylic painting, and oil paintings comprise my three separate bodies of painting. For two years I committed my painting to ink wash.
David: How would you describe your creative process? Allyson: My creative process is my life. A perfect day and most days include practicing piano, creative writing, painting, and developing CoSM, our social sculpture. When I look I cannot find anything in my life that is not creative. Taking a bath can be creative. Process means having a plan. I have a plan for my bath. Ashely Josephine Foreman is an accomplished artist based in Northern California. Her work has appeared in galleries, community spaces, coffee shops, and at numerous transformational art and music festivals. Ashely collaborates extensively with other artists, including large-scale murals with The Union & Phaneros Gallery. Beyond the canvas, she works in digital illustration, teaching, and tattooing, and her work can be found on clothing and other licensed materials. David: How has teaching art to others affected your own creativity, and what advice would you give to young artists just starting out, especially women artists? Ashely: Teaching is a path to mastery, and it is also very emotionally rewarding! Primarily, helping other people feel empowered in their own creativity is probably the first part of what excites me about it. Secondarily, I enjoy teaching because it shows me how much wisdom and knowledge I have inside that I don’t realize is there until someone draws it out of me. My advice to anyone starting out is to play. If you’re done playing, and you want to get real good, start to pay attention to how you are breathing. Pay attention to your thoughts. Your thoughts are the only things that seem to keep you from improving, from concentrating on what you need to learn. We get all caught up in frustration, doubt, and insecurity, and then we quit. Look at those frustrations, and ask yourself what they really are. Whenever your studying becomes difficult, this is the best place to be--because that is the point of growth. Embrace it. Study the fundamentals--they really help strengthen your ability to execute your visions. At the same time, be sure to play and let all the rules go. The combination of discipline and play are really great. Growth comes quickly when there is momentum. Playing, practicing, and putting action into your art regularly will reap great rewards. Nana Nauwald is an internationally recognized Visual artist and worldwide expert on shamanism who lives in Germany. For more than twenty years she has studied different forms of shamanism, particularly in the Peruvian Amazon and Nepal as well as in Europe and Siberia. Nauwald has also researched and practiced ritual body postures and is the author of twelve books about shamanism. David: How did you first become interested in the interface between shamanism and creative expression? Nana: I grew up in a world that was signified through art and experiences in nature and imbedded in a world of fairy tales. Fairy tales and myths have been the companions of my childhood; so it was always natural for me to notice that there is an unseen life behind every appearance in nature. These unseen worlds expressed themselves easily for me to “see” in sparkling, changing colors, and forms. I first came in contact with the expression “shamanism”--as the interface of art and the spirit of nature, the spirit of life when I studied art. Today, after more than thirty years of exploring and experiencing fields of shamanic consciousness, after finding more and more ways of making this field visible, these two areas for humanity are “one” inside of me. 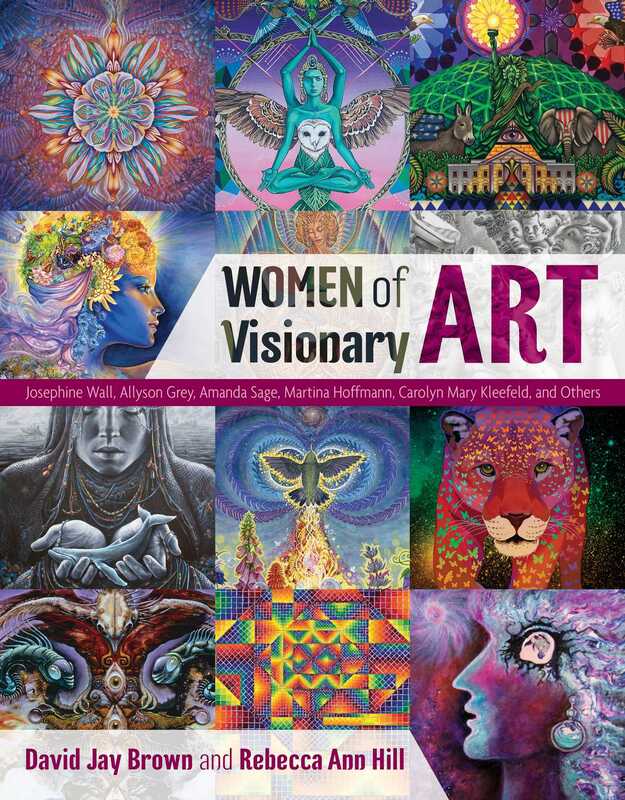 "Women of Visionary Art is an impressive 8.5x 11 inches, full-color art-piece packed with illustrations of some of the most talented, visionary women artists of today. This array of women artists truly makes you feel that you are part of something larger - a step forward perhaps, where artistic expression and spiritual vision are right there in front of your eyes to be enjoyed."